Hamilton is an industrial Canadian port city in the province of Ontario. 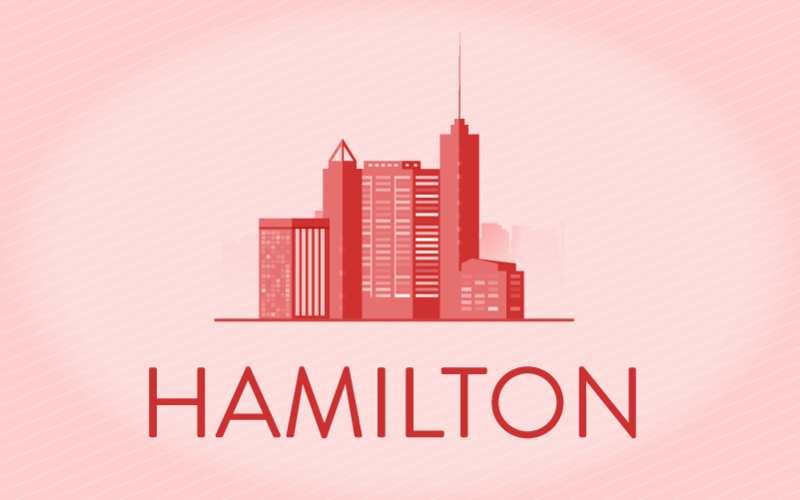 With just over half a million people living in the city, and 750,000 living in the surrounding metropolitan area, Hamilton is both a cultural hotspot and the economic powerhouse of the surrounding area. Wrapping around Lake Ontario and close to Niagara Falls, Hamilton is also the gateway to a number of beautiful natural attractions. Home to the Royal Botanical Gardens, the Bruce Trail, McMaster University, and Mohawk College, Hamilton is a lively and accessible city that lies at the center of the Golden Horseshoe - the most densely populated and industrialized region in Canada. Hamilton is the heart of the Golden Horseshoe, a secondary region of Southern Ontario that stretches between Lake Erie in the south to Lake Scugog in the north. This area has a population of roughly 9 million people, including Greater Toronto, Hamilton, and the Regional Municipality of Niagara. The Golden Horseshoe accounts for 21 percent of the Canadian population and over half the population of Ontario. Hamilton is a major manufacturing hub and is known as the "Steel Capital of Canada." While the city is attempting to diversify by developing 2,500 acres of greenfields that could generate 90,000 jobs by 2031, Hamilton’s backbone is industrial development. The geography of Hamilton is based around Hamilton Harbour and the Niagara Escarpment, which runs through the middle of the city and divides Hamilton into its "upper" and "lower" parts. The Hamilton of today was formed in 2001 from the amalgamation of "old" Hamilton city and five neighboring municipalities: Ancaster, Dundas, Flamborough, Glanbrook, and Stoney Creek. The new city has over 200 neighborhoods and surrounding communities, which are divided into the escarpment and sub-escarpment areas. Despite its industrial reputation, Hamilton also has a number of beautiful green areas such as Cootes Paradise and the Royal Botanical Garden. Hamilton is an education hub for the surrounding area, with several tertiary institutions based in and around the city. Along with the massive McMaster University, the city also houses McMaster Divinity College, Mohawk College, Redeemer University College, and Brock University. While mostly recognized as a working city due to its strong manufacturing core, the culture of the city of Hamilton is alive and kicking. The Art Gallery of Hamilton is Ontario's third largest public art gallery, McMaster Museum of Art (MMA) features a number of great works, and a growing young art scene continues to cement its reputation as a young and hip city. In terms of festivals, Hamilton has Music on the Waterfront over summer and the Waterfront Festival of Lights over winter. Hamilton market becoming oversaturated, attractive interest rates and general affordability are likely to keep the condo market ticking over for some time. This neighborhood is the face of modern Hamilton, with its young and hip vibe attracting a lot of attention from Hamiltonians and new residents. A number of exciting new restaurants and boutique stores have opened in Crown Point East, with new condo developments in and around this area changing the way people live and work. While Crown Point West might not have the same hipster vibe as Crown Point East, it is also going through a metamorphosis. According to Tina Doyle from Remax Escarpment Realty Inc, property prices in this neighborhood have increased by more than 100 percent over the last five years. Crown Point West has a strong contingent of young families, with a healthy split of 76 percent home-owners and 24 percent renters. Gage Park is slowly turning from an insider secret into a thriving artistic neighborhood. As other parts of the inner-city get taken over by lawyers and financiers, young Hamiltonians are gravitating westward to Gage Park. This lakeshore neighborhood has become the new home to countless artists, students, and young professionals. In many ways, the urban settlement of Gage Park represents the new face of post-industrial Hamilton. While not a neighborhood per se, Locke Street is a vibrant Lower City road in Hamilton with a range of shopping and entertainment districts. Known as a "street of churches" and antique shops, this part of Hamilton attracts the young and curious. Locke street is close to major highways. Locke street hosts a number of festivals throughout the year, including Spring Blooms on Locke which marks the end of winter. St. Claire used to be the kind of neighborhood that Hamiltonians avoided, but this is slowly starting to change. A number of new condo and commercial developments have helped to breath new life into the area, with old schools converted into lofts and new eateries starting to line the streets. One exciting new development is the Stinson School Lofts, a schoolhouse built in 1894 that has been transformed into luxury penthouse suites. Gibson has become a real estate hot spot for investors outside Hamilton, many of who are attracted to the old Victorian homes of the area and the affordable prices on offer. This neighborhood is popular with singles and young families, with a split of 52 percent renters to 48 percent homeowners. Dundas is a thriving community at the bottom of the Niagara Escarpment, with this former town nicknamed the "Valley Town" due to its geographical location. Roughly 20,000 people call this neighborhood home, with notable events including the Buskerfest in early June, and the Dundas Cactus Festival in August. This residential neighborhood is located near McMaster University, making it a favorite among students and educators. Centered on Alexander Park, this neighborhood is on the rise after facing its fair share of challenges over recent years. While homelessness and poverty are still prevalent in Ainslie Wood, its close proximity to the forest-covered Escarpment, the Rail Trail, Stroud Park, and Alexander Park make it a great part of the city. Whether you're looking for great food, inspiring art, or fantastic shopping, Downtown Hamilton is the heart of the city. The re-emergence of this neighborhood parallels the growth of modern day Hamilton, with inner-city living and commercial activity slowly transforming the city and its historic business district. The Westdale neighborhood features tiny indie bookstores, boutique fashion outlets, and a great art-house cinema. Primarily a residential area, Westdale is located near McMaster University and the beautiful nature reserve known as Cootes Paradise. This extensive reserve marks the western end of Lake Ontario and provides the opportunity for numerous recreational activities. Coletara Development is dedicated to fully integrated community building in Hamilton. This company has been involved with mid-rise and high-rise condo developments for over a decade, focusing on quality homes at a reasonable price point. Coletara has a proven track record in Mississauga, Guelph, Ancaster, and across Southern Ontario. Condo projects by Coletara Development include Platinum, Onyx, and Liberty Square. Platinum is a luxury high-rise development in the heart of Downtown Hamilton, with this new project promising style and comfort in an iconic 24-storey tower. With stunning views of Lake Ontario and the Niagara Escarpment, Platinum is the perfect place to discover the urban playground that is modern Hamilton. The suite interiors feature nine foot ceilings, stainless steel appliances, and lavish finishes. Pick from a variety of condos with different floor plans, each boasting a private balcony. Branthaven Homes wants to help you to live your best life through the construction of bright and spacious condo communities. Fresh interiors and forward thinking design are at the heart of the Branthaven philosophy, and this company is dedicated to style and the creation of positive lifestyle communities. Condo developments by Branthaven Homes include Explore, Casa Di Torre, The Taunton, and Oakvillage. Explore offers a range of stylish townhouses and semi-detachable homes in the heart of East Hamilton, with sales now open and prices starting from the mid $400,000's. Starward Homes has over 100 years of building experience in and around Hamilton, Ontario. This family business, which has passed through four generations, continues to strive for excellence in every aspect of construction and design. Their commitment to quality continues to inspire new condo communities across the city. Prominent condo developments by Starward Homes include 153 Wilson West, Chedoke Heights, and Scenic Trails. Located in the highly sought-after Hamilton West mountain brow, Scenic Trails is a mid-rise development with 144 units. In this development, two bedroom units of 1000+ square feet are still available, but the building features both one and two bedroom units. All come with hardwood floors, their own private balcony and laundry room. LJM Developments creates architectural and well constructed condos and modern homes that exceed market standards. This company has been in operation since 2001, in which time they've been involved with a number of residential and commercial developments across Ontario. Prominent condo developments by LJM include Appleby Gardens, Waterfront Condominiums, Kings Park, and Eleven Superior. Waterview Condominiums is a contemporary design that provides resort style living and state-of-the-art fixtures. With sophisticated modern finishings and an unparalleled waterfront lifestyle, this project is sure to be popular. Vallery Homes has a long history that stretches back to the 1950s. As one of the preferred new home and condo builders in Hamilton and Southern Ontario, Vallery know what it takes to produce stylish and livable condo communities. Current condo communities by Vallery include North Oakville, The Pinnacle, Residences of Royal Connaught, and Mount Pleasant Meadows. The Pinnacle is a new high-rise project that offers luxury and style in a range of one, two, and three bedroom suites. Features include large balconies, concept designs, and gourmet kitchens. Lamb Development creates stylish condo projects for Canadian cities. Founded in 2001 by one of the country’s leading condominium brokers, this company was designed to bring something unique to the table. Since that time, Lamb Development has created 17 condo projects, with another four under construction, and eight in the development phase. Well-known projects by Lamb Development include The Brant Park in Toronto, Gotham in Ottawa, and 6th and Tenth in Calgary. Television City is currently under development in Hamilton, with this amazing $360-million-dollar project set to house 618 units in two separate high-rise towers connected by a skywalk. Diamante has been involved in real estate development in Hamilton for over 20 years, in which time they've designed and constructed a range of unique and diverse housing projects. The Diamante portfolio ranges from revitalized retail and commercial properties on Hamilton's hip James Street through to residential condos on Burlington's waterfront. The Diamonds Condominiums by Diamante Investments is a new pre-construction development located at 75 Canterbury Place in Toronto. Tivoli Condos is a new pre-construction condo development by Diamante Investments in Hamilton. Located in the heart of Hamilton’s most connected neighborhood at James Street North and Vine Street, this project will provide easy access to nearby parks such as Gore Park and Beasley Park. Dicenzo Homes takes great pride in enhancing modern lifestyles through design and architecture. This family business began in 1952 when Tony DiCenzo built his first family home. Since then, this company has been involved with the design and construction of countless family dwellings and high-rise residential developments. Condo projects by Dicenzo Homes include Monterey Heights, Stonegate Park, and Foothills of Winona. Monterey Heights offers modern luxury townhouses and condos in upscale Ancaster, just a short hop away from the green forests and waterfalls of the Dundas Valley. The Van Kleef Group is a relatively new builder and developer responsible for The Vista Condos. For this project, they joined together with Lintack Architects Inc., Design Thinking, and St. Jean Realty Inc. Brokerage. Currently in preconstruction, this inspiring low-rise condo building development sits on top of the Hamilton escarpment and has been designed with three price points. Located at 467 Charlton Avenue East, this 6-storey building will include 162 units, with prices starting from the mid $200,000s. From townhouses and condos through to semi-detached and detached houses, Rosehaven has been constructing great family homes in Hamilton for over 25 years. Rosehaven Homes takes great pride in their superior level of customer service and attention to detail. Condo projects by Rosehaven include Tiffany Hill, Affinity Condominiums, The Neighborhoods of Mount Pleasant, and Oakville Condominiums. Tiffany Hill in Ancaster offers singles and townhomes in a small-town environment in upscale Ancaster. This inspiring development is located in a picturesque location close to trails, woodlands, and waterfalls. The real estate market in Hamilton had a mixed year in 2017, as the frenzied pace witnessed at the start of the year slowly transitioned into subdued activity and falling prices. Price stabilization is likely to continue as we head deeper into 2018, as the new stress test comes into play and buyers deal with oversupply. According to the Canada Mortgage and Housing Corp, average prices are likely to be somewhere between $535,000 and $585,000 throughout 2018, a wider margin than the 2017 results of between $555,000 and $575,000. According to separate figures from the Realtors Association of Hamilton-Burlington (RAHB), the median sales price was $539,033 in March 2018, down 8.6 percent from a year ago. After reaching their peak in April 2017, housing prices have been slowly sliding. Sales activity is also down, with overall residential sales 37.8 percent lower in March than they were a year ago, residential freehold sales 38.4 percent lower, and condominium sales down 35.5 percent. While new listings were down by 3.2 percent over the year, they were up 8.5 percent from February. Despite falling prices over the last nine months, certain areas remain heated. The neighbourhoods of Stoney Creek and Winona have seen strong appreciation of 28 percent over the last year according to figures from Zoocasa, with Kirkendall North and South, and Durand recording 27 percent growth. Despite falling prices compared to the April peak, more than half of Hamilton's neighbourhoods have seen prices rise by more than 15 percent since 2016. Corktown, Stinson, Highland Park Survey, and Dundas have increased by 23 percent, with St. Clair, Blakeley, and Delta West increasing by 19 percent. The condominium market in Hamilton has enjoyed a frantic few years, with 1,391 units built between 2013 and 2016, 2,221 units currently in progress, and 2,488 units "under discussion" According to RAHB, the average sale price for a condo in March 2018 was $401,578, a drop of 1.6 percent from a year before. Condo listings are mostly unchanged at 346 compared to 350, with average days on market increasing from 19 to 29 over the year. The fast pace of condo building activity has led to an oversupply in some areas, with the end of month inventory being 385 compared to just 216 the year before. The future of the Hamilton property market will depend on economic fundamentals and the effect of the new "stress test" for buyers that was introduced in January. The new test sees banks analyzing monthly mortgage payments as if interest rates were 2 percent higher, something that will lower the amount buyers can borrow and reduce demand by allowing fewer people to qualify for loans. This could see condo prices drop even lower, with high levels of inventory creating a buyer’s market that is likely to present great opportunities for clever investors. Buying a condo is very different than purchasing a single family home. The first thing to understand about condos is that they represent a form of legal ownership rather than a type of construction. While most people associate condos with mid-rise or high-rise buildings in urban areas, they can also be duplexes, townhouses, or even separate dwellings. Before you search for a condo, it's important to manage your finances and get pre-qualified for a mortgage. Banks and other lenders are familiar with condos and will have different rules in place to qualify potential buyers. Before they pre-qualify you, lenders will take a long and detailed look at your income, debt levels, and credit history. They want to know if you can pay back the loan without undue hardship. Once you have pre-qualification in writing, including a guarantee interest rate, you will be able to search for condos within a designated price range. In order to improve your chances of pre-qualification, save as much as possible to increase your down payment, pay off as much debt as possible, use existing equity to your advantage, and work to improve your credit score. How to research the location? When it comes to buying a condo, location is everything. While a condo doesn't have to be located in an urban setting, many people choose the condo lifestyle because they want to be close to the action. Whether it's nightlife, shopping, or transportation hubs, you need to decide what’s important to you and how close you want these amenities to be. While native Hamiltonians will probably have a good idea of where they want to live, if you're coming from outside the city, you may need to spend some time researching the local area or talking to a real estate agent. Along with time on the streets, you can also take a look at safety and crime data, neighborhood demographics, and economic forecasts. As well as lifestyle decisions, it's important to look at market trends in order to improve your return on investment. Take a look at new developments to get a good idea of potential growth, both by the City Council and commercial developers. Are the demographics changing in a certain area? What is the relationship between supply and demand? How long does property sit on the market before it’s snapped up? What is the auction clearance rate? Does the recent growth history of the neighborhood move with or buck against wider city trends? How to qualify a property? Qualifying a property is important before you sign a contract, so take a detailed look at location fundamentals, market data, and growth forecasts. Even if you're not thinking about reselling your property now, there may come a time when you want to move on. Along with market data, it's important to research the building and developer. Will any significant capital improvements be needed to the condo property? Are there any major lawsuits against the developer or condo association? What are the condo bylaws and how are they likely to impact your quality of life? Last but certainly not least, it's important to analyze and compare maintenance fees and maintenance fee structures. What services are included in the monthly fees? Are fees likely to increase in the future? How do the fees compare with similar buildings in the area? Property tax bills are mailed out twice each year, with the interim tax bill due on the last business day of February and the final tax bill due in two installments on the last business days in June and September. The final tax bill is calculated once City Council has approved the annual budget, with the final amount due being the total taxes levied minus interim taxes plus any outstanding balance. Hamilton property owners will be expected to pay higher property taxes in 2018, with a 2.3 percent rate hike introduced by the city’s corporate finance general manager Mike Zegarac. While this is much less than the 4.8 percent increase originally forecast, it will still mean an increase of $77 for a home assessed at $300,000. The 2018 increase comes after a 2.2 percent increase in 2017, which saw an increase of $73 on a home valued at $300,000. The rate of property tax increase in Hamilton is one of the lowest compared to neighboring municipalities, with Ottawa’s 2018 tax increase being 2 percent, Kingston's being 2.5 percent, Windsor sitting at 2.6 percent, and London sitting at 2.8 percent. Property taxes may increase in coming years, however, due to a higher minimum wage and the potential for higher levies from the Halton, Grand River, and Niagara Peninsula conservation authorities. Maintenance fees, also known as condominium fees, or homeowners association fees, are designed to cover the cost of building repairs, cleaning, landscaping, staff wages, insurance, and amenities such as a pool or gym. When you purchase a condominium, you're also responsible for the common areas and assets of the building. Most fee structures will also include a significant contingency reserve fund, which is designed to cover the costs of extensive repairs and unforeseen damages. Maintenance fees are designated by the individual Condo Corporation and are generally paid monthly. What’s included in maintenance fees? The existence of monthly maintenance fees is perhaps the biggest difference between condos and other properties. Once you have made the purchase, you still need to pay regular fees to finance community and building expenses. Fee structures can differ widely between properties, so it's important to ask questions sooner rather than later. While all maintenance fees will include regular cleaning, upkeep, and insurance, some will also include utilities, staff wages, property taxes, and parking. Fees can also differ widely between buildings based on their size and age. In smaller buildings, the same services need to be covered by fewer people. In older buildings, more significant repairs may be required. Q. How diverse is Hamilton? A. There are roughly 530,000 people living in Hamilton City, with more than 20 percent of the local population not born in Canada. This is the third highest number after Toronto and Vancouver. The highest number of immigrants come from Italy at 9.3 percent, followed by Poland at 4.8 percent, India at 4.7 percent, Portugal at 4.6 percent, and Philippines at 4.2 percent. Q. What are the most popular tourist attractions in Hamilton? A. Hamilton is home to many attractions, including the Royal Botanical Gardens and the Canadian Football Hall of Fame. Other popular attractions include the Canadian Warplane Museum, Dundurn Castle, Bayfront Park, and Gage Park. While not in Hamilton itself, lots of people use the city as a stepping stone to the great Niagara Falls. Q. How industrial is Hamilton? A. While Hamilton is often recognized as a cold and gray industrial city, it's not quite that simple. The walking trails and waterfalls that line the escarpment offer a unique glimpse into nature, Cootes Paradise reserve is a delight, and the old-school feel of Locke Street is authentic in every way. For a growing number of people, Hamilton’s balance of small-town feel and big-city amenities is just right. Q. Is there an arts scene in Hamilton? A. Along with well-known galleries such as the McMaster Museum of Art (MMA) and Art Gallery of Hamilton, the city has received a lot of attention for its thriving young arts scene. The Factory: Hamilton Media Arts Centre opened up a new home on James Street North in 2006, with smaller galleries popping up on James Street, King William Street, Locke Street, and King Street. Carlisle focus is on developing low-rise condominiums that cater to the entry-level market. They offer high quality condos at competitive pricing. They work hard to maintain their position in the marketplace as a cost-efficient multi-family builder, thus enabling them to pass on the savings to customers. With Carlisle, you can count of masterfully finished condos, in desirable locations that meets the criteria for a lifestyle community. Founded in 2000, Avi's vision is to design and build modern condominiums that blend innovative design with high quality finishes, yet at an affordable price. With decades of experience, the company has a reputation when it comes to providing high quality condos. The team constantly pushes the bar higher in providing innovative, functional and beautiful condos. The Trico Group was founded in June 1992 by Wayne Chiu, an engineer educated in both Winnipeg and Hong Kong. For over 20 years, Trico Homes has continued to develop award winning condos in Calgary and surrounding communities. With over 8,900+ of finished homes, Trico has established itself as a premier builder of innovative homes with a solid reputation for integrity, quality craftsmanship and customer service.